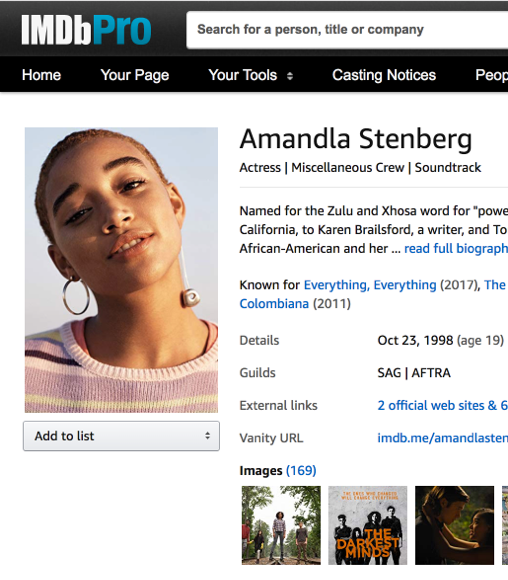 Named for the Zulu and Xhosa word for "power," Amandla was born in Los Angeles, California, to Karen Brailsford, a writer, and Tom Stenberg, a businessman. Her mother is African-American and her father is Danish (and of part Inuit-Greenlandic ancestry). Larissa Wilson was born on May 5, 1989 in Bristol, England. She is an actress, known for Skins (2007), Trollied (2011) and Tormented (2009). Angel Coulby is an English actress. She made her television debut in the BBC comedy 'Orrible. She is best known for portraying the character of Queen Guinevere "Gwen" Pendragon in the BBC fantasy series Merlin. Ashley Madekwe (born 6 December 1983) is an English actress. She is known for her roles as call girl Bambi in the ITV2 series Secret Diary of a Call Girl, social climber Ashley Davenport on the ABC drama series Revenge and the witch Tituba in the WGN America series Salem. Jillian Estell is an actress, known for Black or White (2014), The Night Shift (2014) and So This Is Christmas (2013). Khandi Alexander was born on September 4, 1957 in New York City, New York, USA. She is an actress, known for CSI: Miami (2002), Patriots Day (2016) and Treme (2010). Aurora Perrineau was born as Aurora Robinson Perrineau. She is an actress, known for Jem and the Holograms (2015), Equals (2015) and Truth or Dare (2018). Gabrielle Dennis is an actress and comedian best known for her work in television as Janay on the hit series "The Game" (CW & BET) and as Denise Roy on Spike Tv's "Blue Mountain State". South African export Lesley-Ann Brandt stars as the Vertigo/DC comic book character Mazikeen, on Fox's hit series "Lucifer." Serayah is an actress, known for Empire (2015), Lucky Girl (2015) and Burning Sands (2017). AzMarie Livingston is an actress, known for Precious (2009), Empire (2015) and The Purge (2018). Bre-Z is an actress, known for Empire (2015), All American (2018) and Fat Camp (2017). Veronika Bozeman is an actress, known for Boy Bye (2016), 90 Days (2016) and Empire (2015). Estelle was born on January 18, 1980 in Hammersmith, London, England as Estelle Fanta Swaray. She is known for her work on Steven Universe (2013), Ride Along (2014) and Obsessed (2009). Marsha Stephanie Blake is an actress, known for Orange Is the New Black (2013), A Gifted Man (2011) and Chicago P.D. (2014). Karen Kaia Livers is known for her work on Homefront (2013), Oldboy (2013) and Triple 9 (2016). Raney Branch is an actress, known for Being Mary Jane (2013), Bones (2005) and Grey's Anatomy (2005). Sabrina Mayfield was born in Hollywood, Florida, USA. She is an actress, known for Pain & Gain (2013), Phoenix Falling (2011) and The Vampire Diaries (2009). Zoë Soul is an actress, known for Prisoners (2013), The Purge: Anarchy (2014) and Reed Between the Lines (2011).